Advent calendars are among of the most trending and popular gift ideas for this upcoming holiday season. For the agnostic or uninitiated, an advent calendar is a specially constructed calendar used to count or celebrate the days in December leading up to Christmas from the 1st to the 24th. The ‘advent’ part comes from Christian tradition, whose 24 day advent season generally starts between November 27 and December 3rd. Each physical advent calendar presents a rectangular “window” front with 24 doors in non-consecutive order to be opened, one each day until Christmas. Whereas traditional calendars opened up to reveal an image, poem, or verse, more contemporary calendars have grown ever more popular. More contemporary calendars feature small gifts, toys, or chocolates, and even the Hubble Space telescope has its own online calendar, viewable here. updated each day in December as new beers are opened. Regardless of whether you’ve already had many Phillips beers, this calendar has enough fresh releases to keep you guessing. It is an opportunity to release your inner child as part of an exciting interactive Christmas themed game, or just have an excuse you can use with your significant other to have a beer every day. The Mystery Gift Holiday Countdown features 22 of the best and most sought-after craft beers from Central City and Parallel 49, as well as two special collaboration beers, one from each brewery. This marks the first time two North American craft breweries have come together to collaborate on an advent-style holiday beer pack. All of the 2014 calendars are perfect for beer geeks and adventurous beer drinkers, great gifts for yourself or others. Try one, or try them all! With only two weeks left until December, and calendars selling fast, it’s best to avoid disappointment and get your calendars now before they’re all gone! Purchase is available online or in-store. As is tradition, on the 3rd thursday of November, the world awaits in anticipation the arrival of Beaujolais Nouveau. deVine’s shipment will arrive by 4pm today. As usual, deVine will be offering the 2014 Georges DuBoeuf Villages Beaujolais Nouveau – $22.99 this year. For the price, the Villages is a much better bottling than the regular Nouveau. The Gamay grapes were picked just three weeks ago, and after a very short fermentation, it is bottled for its freshness while offerinig beautiful strawberry, black currant, bannana and some hints of cedar with a nice backbone that gives off bright, lively flavors of morello cherry confiture and finishing with hints of allspice and cloves. Nice smooth mouthfeel and virtually tannin free due to the short exposure to the skins. So, for your Beaujolais Nouveau party, serve this slightly chilled with some poultry or spicy meatballs and for something ambitious and over the top, a roast duck with a reduced cherry sauce. 4) Beaujolais Nouveau must be drank sooner than later and served slightly cool at about 13C. 5) Beaujolais Nouveau is a marvel of modern day advertising, with the marketing engine in full force, arriving just in time for the American thanksgiving, and 70 million bottles overall. How they manage to ship everything in a timely manner boggles the mind. Purchase your 2014 DuBeouf Beaujolais Nouveau online here..
Back in earlier days, when we first had a vision of what deVine Wines would be, we couldn’t have imagined so many things – our amazing customers, the ability to bring great wines and spirits to the city that we love, and, more recently, being given an award that bears the name of one of the giants in our industry here in Alberta. 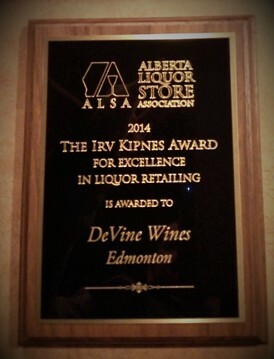 On September 30, deVine Wines received the Irv Kipnes Award for Excellence in Liquor Retailing. This honour, bestowed upon us by the Alberta Liquor Store Association (ALSA) was a moment for us to take a deep breath and realize how far we’ve come. This award is given to the store that encompasses all that a liquor store should represent – from a diverse product selection, store ambiance, excellent customer service, marketing, online presence, and representation in the community. We’re grateful for this award, given to us by ALSA, the group that helps ensure equitable, fair, and consistent representation for liquor retailers in Alberta, is momentous; and we’re pleased and proud to be a part of the membership of such an effective advocate in our province. Being nominated for this award by the vendors and product representatives that help us give you the best products we can only serves to make it even more special, and we’d like to thank them for their support. However, the thing we cherish most about winning this award is that it reminds us that we are able to do what we love because of you, our customers. Back in our early days, there was a certain amount of risk and uncertainty when we first envisioned what a fine wine, craft beer, and spirits boutique in the heart of downtown Edmonton would look like. We came together, and with hard work, sweat, hope, and a lot of sleepless nights, we opened for business on February 28, 2005. It was with baited breath that we opened our doors to the first customer, and, thankfully, we’ve been going strong ever since. However, it wasn’t until we received a similar version of the Irv Kipnes award in 2006 that we realized we, in all probability, had a good shot of making our vision of success a reality. Back then, the award was named the ALSA Edmonton and area liquor retailer of the year award, but it meant just as much to us then, if not more, than it does today. It meant that we were doing something right. It meant that our customers were able to find products that they loved; and, quite possibly, were introduced to some new wines, craft beers, and spirits that they hadn’t previously encountered, and would be back for more. It meant that our relationships in the industry were valued by more than just us. It meant, that for the time being, our vision, our business, our dream was a success. Forward to present day, and to finding out that we had once again been nominated for another prestigious award, but this time, it was named after a legend in our business. Forward to finding out that we had won, that we had once again been given the recognition of our peers as having provided an atmosphere that allows our products, our staff, and mostly, our love of our work, to shine. There is no greater achievement than knowing that all of our hard work paid off and that we are still able to provide you with a store that you love to come and visit. A store that can provide you with the top notch wines, beers, and spirits that you choose to bring to your family, your friends, your tables, and your most special occasions. A store that stays true to the vision we had almost 10 years ago; one that we know wouldn’t be what it is without each and every one of you. So, while we are extremely grateful to the ALSA, to our product representatives and vendors, and to Mr. Kipnes, our gratitude must be expressed mainly to two very important groups of people. The first is our wonderful employees – without their knowledge, dedication, commitment, and drive to provide outstanding customer service, we could never hope to win such an award. The second is you – our customers. Without your continued support we would not be able to come to the store that we love and do what we do every day. You continue to inspire us to provide you with the best that we can, from our website, to our staff, to our products, to our relationships with you. In reality, this award belongs to you all, and we’re honoured to be able to share it with you. For winning this award, and for helping us make our dream an award-winning reality, we thank you. Your support continues to inspire us to provide you with the deVine Wines that you (hopefully) love.